Teams went into the competition knowing where they were in the standings. The 11 schools in the B Division—schools with an enrolment of less than 100 students between Grades 2-6—kicked off the action on Wednesday. With defending champion Joyce Samuel moving up to the A Division this year, the B Division title wss up for grabs, as a tight race was on following the pre events. 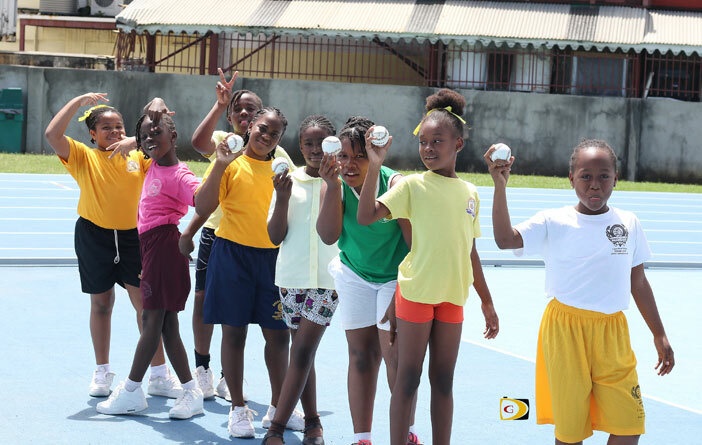 Heading into Wednesday’s action, former champs Ivan Dawson held a two points lead over Jost Van Dyke, at the completion of the U11 Boys and Girls and the 13+ Boys and Girls Long Jump and the U11 Boys and Girls and U13 Boys and Girls Baseball Throw. Ivan Dawson had amassed 45 points to Jost Van Dyke’s 43. Lenora Delville accumulated 42. Both Alexandrian Maduro and Virgin Gorda’s Robinson O’Neal are in a fourth place tie with 36 points. Pelican Gate occupies sixth place with 28 points followed by Isabella Morris who has 26. Cedar International garnered 23 and Corner Stone, 10. Anegada’s Claudia Creque school which was unable to participate because of inclement weather, was to contest the respective divisions in which they had pre events athletes entered, with the other classes and their scores factored into the competition. Schools in the A Division competed on Thursday. St. Georges, on the strength of its Boys who won every division of the Long Jump and Baseball Throw, led perennial champs Althea Scatliffe by four points, 57-53. Willard Wheatley was third with 43, while there was a three way tie for fourth between new comers Joyce Samuel, Francis Lettsome and Enis Adams, all having 33 points. Ebenezer Thomas lied in seventh with 29 points and Bregado Flax rounded out the pack with 25. A full report on the competition will be available in the next Island Sun edition.